darkSpyro - Spyro and Skylanders Forum - Skylanders: Swap Force - All we know about Swap Force (13/10/13) - Post discovered info here! darkSpyro - Spyro and Skylanders Forum > Skylanders: Swap Force > All we know about Swap Force (13/10/13) - Post discovered info here! In Skylanders: Swap Force, Portal Masters embark on an all-new adventure in the mysterious Cloudbreak Islands, home to a mystical volcano that erupts every hundred years to replenish the magic in Skylands. During an epic battle, a brave group of Skylanders were caught in the volcano's eruption, which blasted them apart and sent them to Earth. But, the magic of the volcano gave these heroes a remarkable new power - the ability to swap halves - turning them into a special team known as the Swap Force. Meanwhile, Kaos is back with a new evil plan. And now, Portal Masters everywhere must reassemble the Swap Force - in their original form or in new combinations - and send them back to Cloudbreak to save Skylands! All characters from Skylanders: Spyro’s Adventure and Skylanders: Giants will work with Skylanders: Swap Force. Magic items from Skylanders: Spyro's Adventure and Skylanders: Giants will work in Swap Force just as they did in the previous games, however location items from Skylanders: Spyro's Adventure will not unlock a level. *Swap Force characters can be seperated into two categories, by their element and by the additional feature that their bases possess. 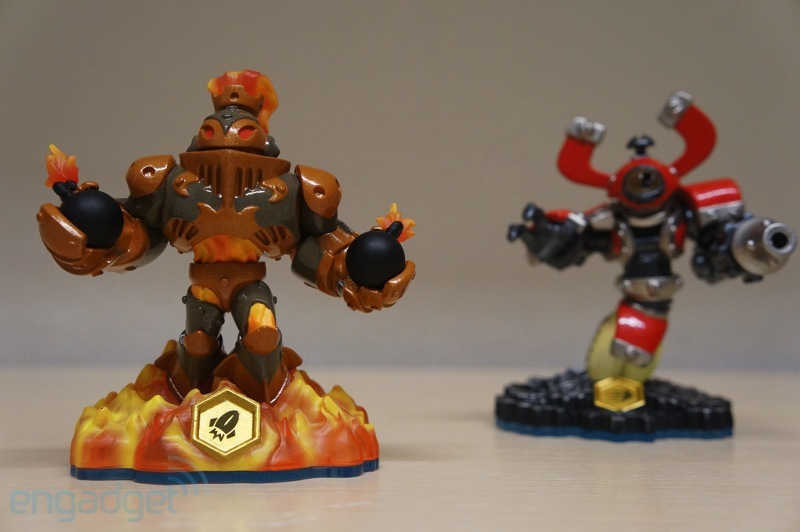 **Series 2 Skylanders are reposes of new Skylanders from Skylanders: Giants. They include a Wow-Pow upgrade. 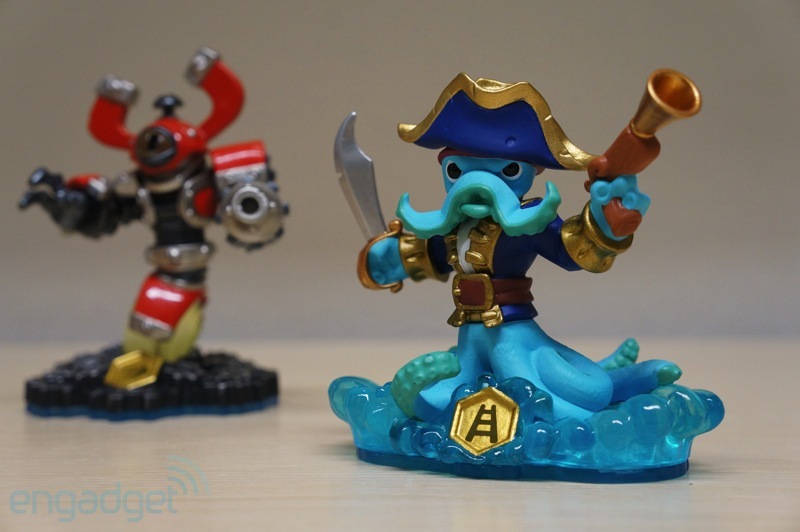 ***Series 3 Skylanders are reposes of Series 2 Skylanders from Skylanders: Giants. 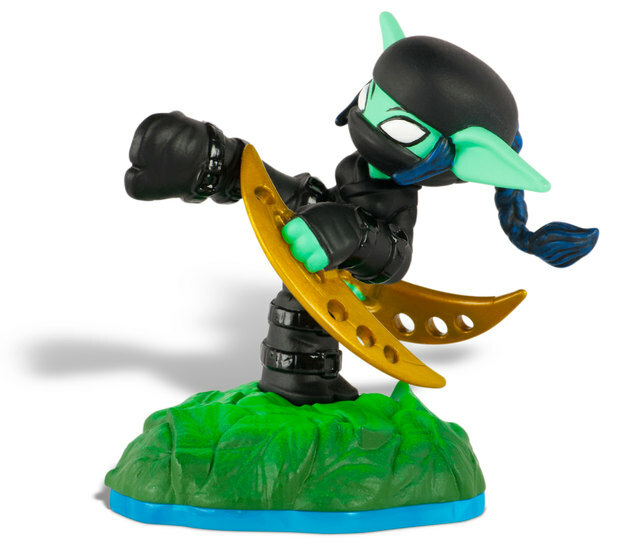 They include a new Wow-Pow, however do not include the Wow-Pow from their Series 2 figures released for Skylanders: Giants. ****Extras include a Poster, Web Codes, Trading Cards and Stickers. -Just added the 'teleport' and 'speed' classes for Night Shift and Magna Charge. -Added confirmation that Freeze Blade is a Water 'lander and they are a member of the 'speed' class. -Adventure and Battle Packs both confirmed to be returning in SSW, mentioned in this article. 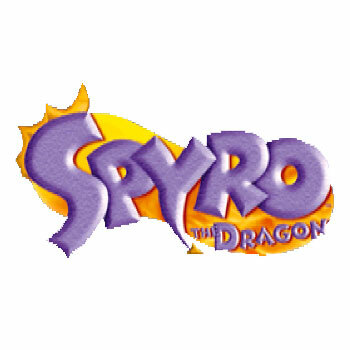 -Series 3 Spyro is a thing! -A lot of characters, new and returning, including a Warnado. The 8 have not been forgotten after all. -Added info about the mysterious collectors edition of the game mentioned here. -Okay, so this is the actual "all characters revealed day", with the missing Life character being Camo and the confirmation of the elements of the unknown corelanders. Well, we know 5 characters. The trailer comes later today. It looks like the hexegon on the front of the swap character bases have something to do with the specialty. IE Magna charge has an arrow which may be attributed to speed. Wash Bucler has a ladder which may have something to do with climbing. Blast Zone has a rocket wich may be for jumpng. Now that we have jumping, i wonder if hats or heroic challenges will have special jump upgrades. will we see a special magic item that helps with jumping, like a spring or a parachute? My kids are going to go ape when they read about this. ^ I think you may be right on the whole ladders/speed ETC thing. Maybe this will be used to the advantage to enter secret areas. Like, ladder characters can climb ladders to secret areas, rocket Skylanders might be able to reach over gaps further than a normal jump? It's quite an interesting concept. What happens when the swap characters die? do both parts become unplayable on that level, or just half? which half? if you swap out half of a dead skylander does he enter the game with half life? If you get a heric challenge upgrade does it stay with the top half or the bottom half or both? I have a feeling that the top half will store all the actual data. The bottom half seems to only be used to define a characters element and a special type of mobility. Cozmo raised a question that has been going through my mind since this info came out....how does the figure retain the information when you've played now!? If you have a base of one character and the body of another. Another question, how does body/base affect the stats of the character? One assumes putting a different base on a body might raise the speed...but maybe it'd lower something else? With this new game we are going to be customizing our characters to a whole new degree! How many crystals should I buy VS how many will I buy!? On a more humorous side... I hope the swap characters are either gender ambiguous or all one gender. the idea of swapping halves of bodies will raise all kindsa questions in my house. think of all the akward conversations with the kids. lol I can I magine this happening. from the looks of it their all gender ambigous. we hope. I presume that the top of each character will have a chip in as well as the base, but the top will store the information. That's just my guess, but since the bases are just used for mobility then I don't see why they'll be designed that they don't specifically effect the upgrades/attacks of each character. As for stats, I think the base will just affect the speed of the character - unless they modify the stats so that they're broken down into, for example, 4 stats based on mobility (such as jump height, speed ETC) and 4 stats based on strength (such as the health, armour ETC). I'm going to assume the need for a new portal is because there is a chip in both halves and the existing portals don't have a strong enough NFC signal to communicate with both chips. 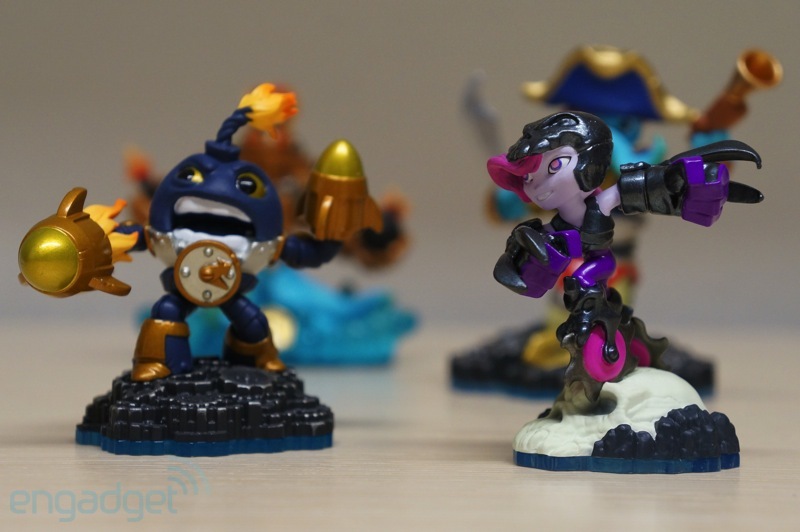 However, if that is true, it also means there may be issues with having Skylanders sat around the portal. I'm very interested in how they're doing the tech this time though and how they're making use of the magnets. Is it one magnet in each half or multiple magnets. Can you knock the character over and it'll still stick together etc. Mr. Cowboy Cthulu is wearing a Napoleon Hat, which is already in the game. Does that mean either the new ones can't wear hats, or will the one he's wearing be replaced, or will it be like like hat inception over here? CILAN IS THE SEXIEST MAN ALIVE. I DARE YOU TO PROVE ME WRONG! ...Actually don't. I'm quite biased. I think one of the most important thing we'll have to see is how these toys will be sold. Are they gonna charge us for individual pieces, or as a whole figure. Will they cost more? What was going on with the topic just then? Is dark52 doing something on the Swap Force message boards? seeing how the franchise became popular and infinity's pricing were stated. chances are were gona see some price hikes and swapforces figs gona priced same as giants due to the tech put in it. but we still have to wait and see. cant wait for the gameplays tho. how big are the swap characters? some of them looklto be almost as big as the giants. The interview on YouTube with the FGTV guy, states they are somewhere between the size of a Giant and a regular figure. ...Oh wow. Magna Charge is as large as Crusher. Mind you, so are some of the S2 characters, if you include their wings ETC - Crusher is one of the smaller Giants. I hope the Swap Force things don't run over $14. That's a nice threshold for me to spend..any more and I wouldn't. So...I GeekDad's review states that the SF guys are basically a double figure. Top part is one, bottom is the other. So like, Wash Buckler and Magna Charge would be "Wash Charge" or Magna Buckler". Am I understanding that right? I didn't really see it in any of the other posts. i for one dont like thr look of the figures there to cartoon like/animated they look like there supposed to be in disney infinity. i wont be buying this game or figures so once i buy the rest of the giants my collection will be up for sale i think. Depends on the head. The head is the first part of the name, the base is the second half. look at these figures. they look like something you find in the bargain bin for a dollar... that is for sure. Oh! I see what you're doing Kappa! You're playing the 'informative troll' - whilst your complaining about something, you're still providing us with information that is relevant to the topic. I'm gonna be the first to say it: I doubt he will. Believe it or not, he's far from a fan favourite - he is considered by Skylanders fans, the target audience, to be an overrated character. I think the target audience prefer 'landers like Wrecking Ball and Pop Fizz to Spyro. Hopefully they fix the mistake of SG and give the 3DS starter pack different characters since everyone will be forced to buy starter packs this time around. I wanted Blast Zone to be in the starter pack. 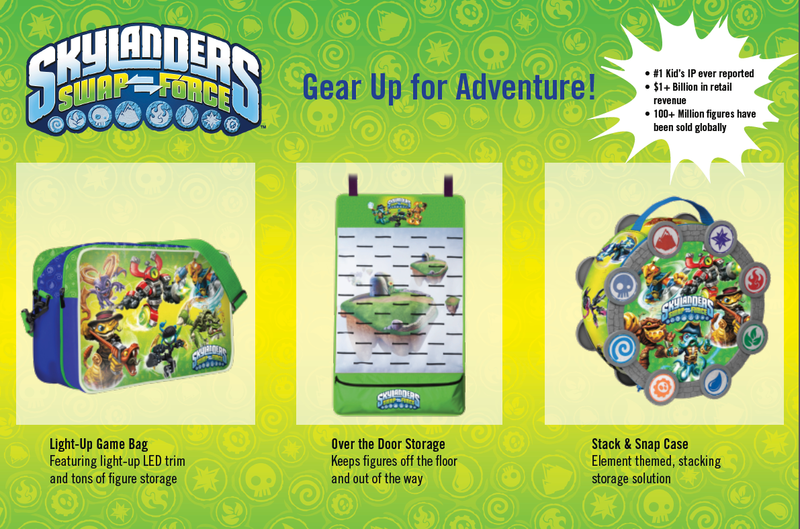 I have a question what are the little symbols on the swap force toys. Go into Orbit, stan LOOΠΔ! They show their movement ability. Thanks But what are their abilities. I hope you are not right. Spyro has a lot of merchandise. Why should he not be a fan favourite? >.< I don't know why Stealth Elf is so popular. Last year, she was one of the first characters that was announced as a Series 2 character and now...Is it the same thing! Apparently the rocket means the SF character can fly to other islands and I'm assuming the ladder means the character will be able to climb to locations others cannot. How long does it normally take in this process for them to release to the public all the other new figures? Days? Weeks? Months? I don't think we got a good look at the new SG characters (Sans Tree Rex,Jet Vac, and Pop Fizz) until E3. I think it will be a couple of months before we know all the new characters. We didn't know about all of the Giants characters until September - I think it's safe to say that this year will be no different. 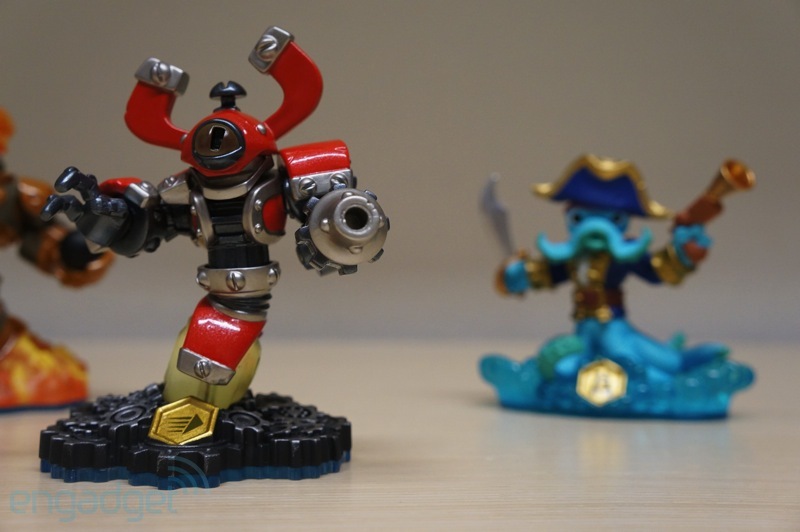 E3 was when we got that quick glimpse at a bunch of new Skylanders during the E3 trailer. We then spent weeks dissecting the freeze frames from that and that god awful blurry pick of the SG roster that someone accidentally photographed when reviewing the merchandise booth. ^ It was mentioned, but we've not seen anything yet. What I am still praying for is Ghost roaster, Voodood, and Dino rang to be reposed. "Well, the gate swung open and a fig newton entered." I hope Warnado and Wham Shell come back..
another observation, in the screen caps you can see that we will be taking on more than chompies and trolls. Little rat guys can be added to the list of baddies. I hope to see some more mobs added to the list. Another ting that has not been dfiscussed is the use/significance of legendary treasures. I would assume we will have some more parts of "something" to find.